We are the leading manufacturer of shakers ss small dabbi. By utilizing our years of experience, we bring forth a qualitative array of Cocktail Shaker. The offered range is manufactured by utilizing superior quality stainless steel and latest technology. Moreover, a team of our quality controllers conduct a series of quality tests on the entire range to seek out any possible defect. We are reckoned as one of the prominent manufacturers and exporters of superior-grade Cocktail Shakers. They are made using premium-quality raw materials in accordance to industrial norms and guidelines. They are resistant to corrosion and abrasion. Their steel body makes them sturdy and damage-resistant. They do not break. Keeping the diverse requirements of customers in mind, we are instrumental in providing Stainless Steel Cocktail Shaker. 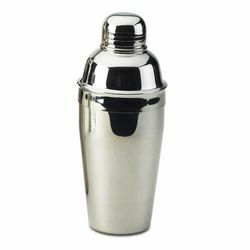 From our wide consignment, we are affianced in supplying Silver Plated Cocktail Shaker. 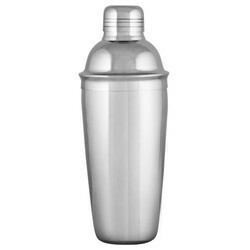 Avail from us SS Cocktail Shakers that are common method for mixing drinks in a simple and straight forward manner. These shaker are available in different sizes like Regular, 30oz, 16oz, 8oz etc. All these products are offered at market leading prices to our customers. The Stainless Steel Cocktail Shaker is ergonomic in terms of design and does not weigh much either. We are reckoned as one of the eminent manufacturers and exporters of excellent quality SS Cocktail Shaker Belly.